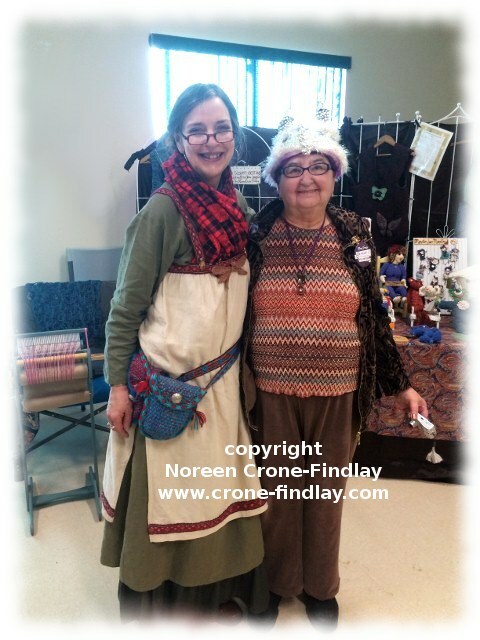 Yesterday, and the day before, my daughter, daughter in love and I were participants in the artisan’s market of the Deep Freeze Winter Festival in Edmonton, Alberta. I loved the wonderful conversations that I had with people who were enjoying the festival. One little guy just charmed me to bits…. 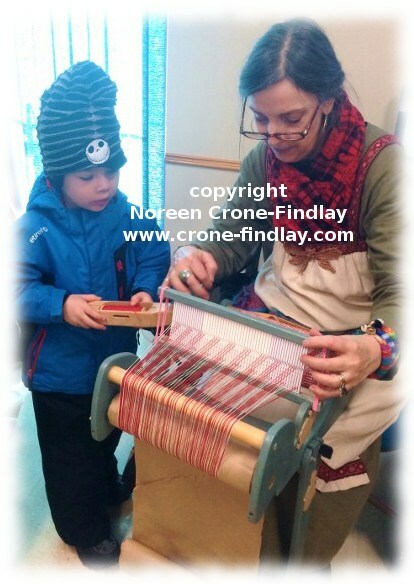 he was an epic weaver, and a total cutie…. I wish that the video was just a few seconds longer, to catch our discussion about him wanting me to give him the shirt that I will be making from the fabric. He didn’t see that I really wanted to keep it for myself as being at all reasonable! LOL! After each artisan’s market or maker’s faire, I am always very touched when I think back to some of the remarkable conversations that I have with people. Often, people will share deeply meaningful glimpses into their lives. I always feel like I have been offered a precious little jewel in the glimpse of their journey that they reveal to me. It’s one of the many things that keeps me coming back as a participant in these magical events. And, I also feel enormous joy when someone comes to my table or booth, and then responds with delight, and laughter and, sometimes, even tears, when they connect with something that I have designed and made. Now, THAT is magic beyond measure!!!! There were all kinds of wonderful things happening outside during the festival. 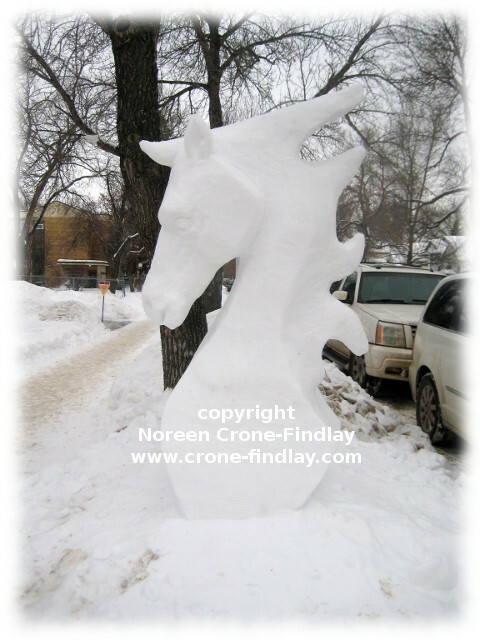 This gorgeous horse was carved in snow outside our venue. I LOVED it! PS: This post: Viking Dress LINK explains why I am dressed the way I am in the photo. On Saturday, I’ll have my booth at the Mercer Collective in Edmonton AB. I am going to be demonstrating weaving in my booth, and I decided that the 6 foot configuration of my Dewberry Ridge Triangle loom will be perfect for this. I had it set up to the 3 foot size, so changes were necessary. 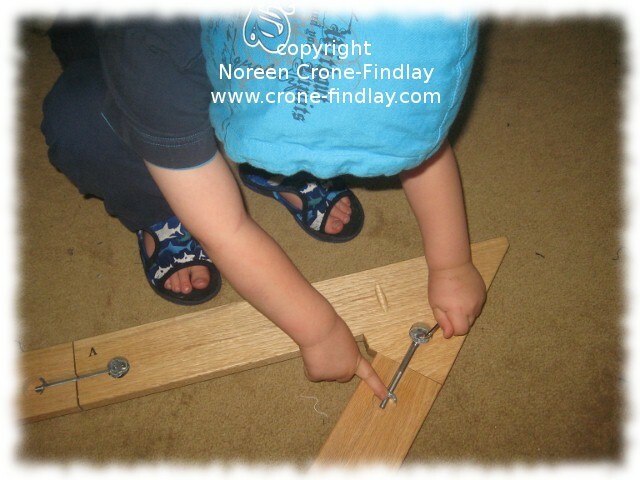 Our 3 year old grandson was over at our house for his weekly playdate, so I asked him if he’d like to help me take the loom apart and put it back together again. 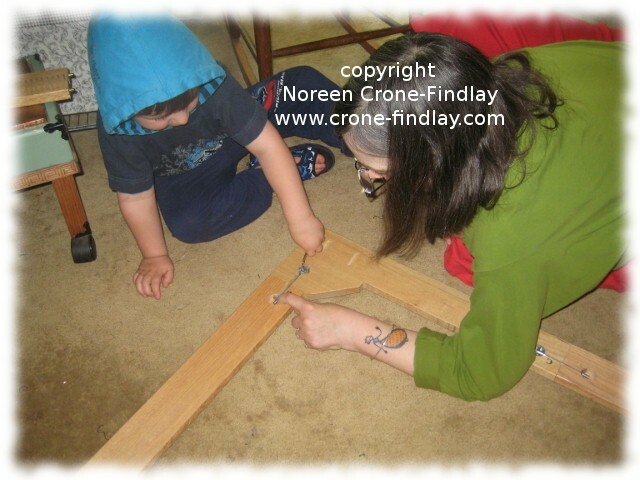 I showed him where the allen wrench goes, and that was it…. he ~got it~ instantly! His mechanical abilities are exceptional…. I know, I know…. proud granny and all that…. but still… he is only 3! 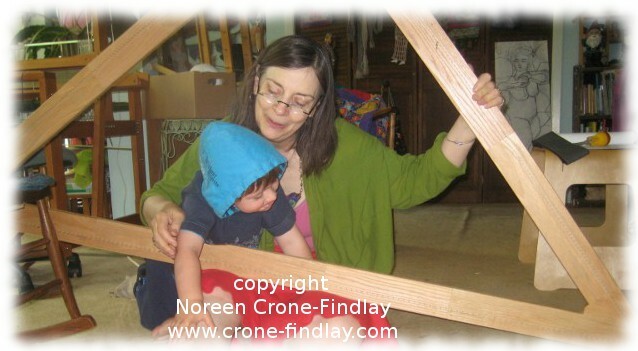 And, thanks to Gary McFarland’s brilliant engineering (he and his wife, Donna, are Dewberry Ridge Looms) my grandson and I quickly and easily had the 6 foot size tri loom assembled. I love watching him weave…. his focus and knowing-ness are so neat! 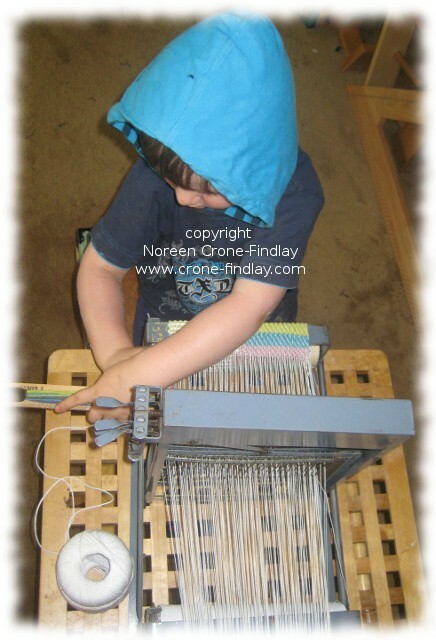 When his mamma and uncle were children, I always kept a loom warped up, just for them. I wish that I had had the Structo then…. they would have loved it! 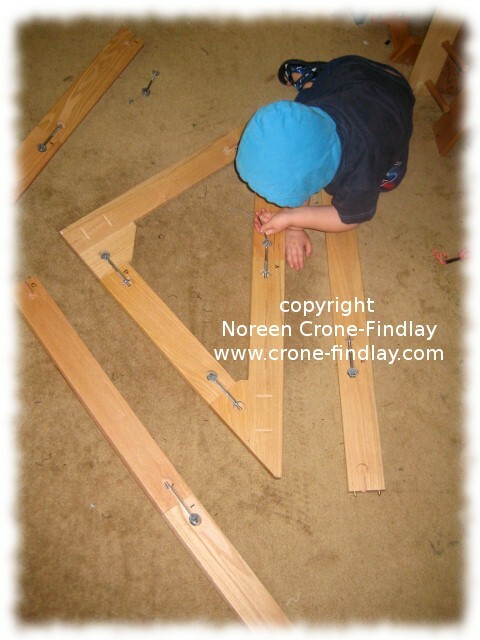 If you are teaching a child to weave, or just want an impromptu, no cost small loom for sampling yarns and colorways, this little loom is very handy. 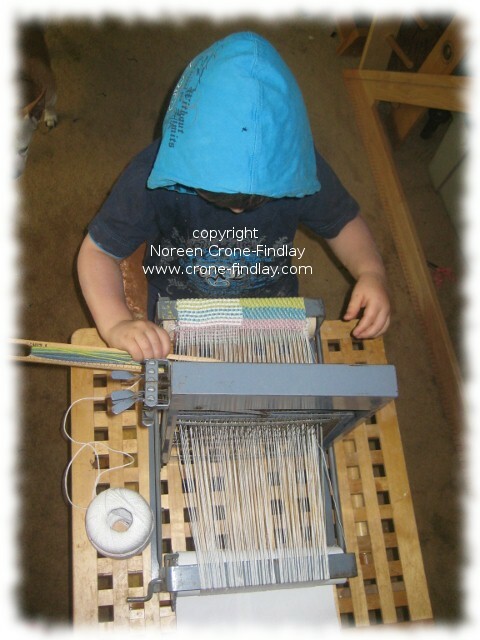 The project on the foam food tray loom is a bookmark, but you can weave amulet bags, rug mugs, small dolls and toys, doll house rugs or squares that you stitch together to make larger projects. It’s great for traveling, as it’s light, and if you use a plastic darning needle for weaving, it’s fine to take through airport security. I think that one of the most accessible looms for beginning weavers is the weaving stick loom. While Chloë has been teaching other munchkins, I have been having a blissful time with her son…. and guess what we have been doing? Yup. I’ve been weaving with my grandbaby. I figure that it is never too early to start children weaving. 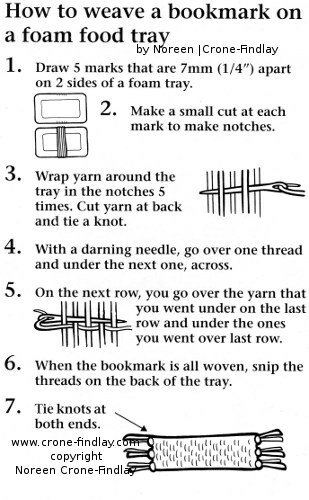 When our kids were little, I had looms warped for them and set up so that they could weave whenever they wanted. And, weave they did. And, even though my son weaves his art through film making nowadays, my daughter is still a weaver…. 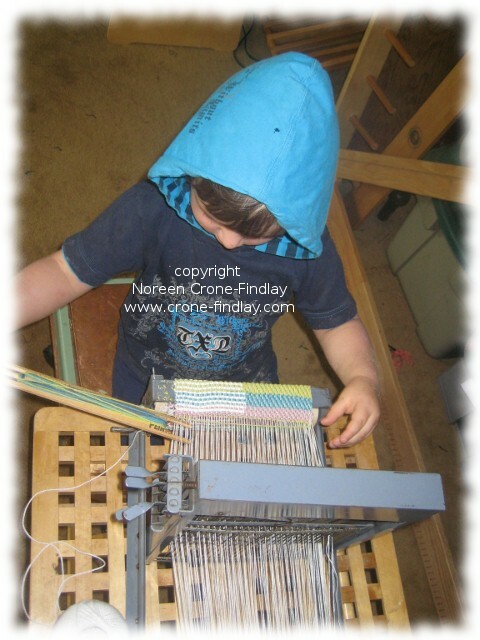 and now we have the next generation merrily enjoying time at the loom…. He’s helping me to weave some narrow warp face bands on my Saori floor loom. The bands will be embellishments for some other pieces that I am working on. 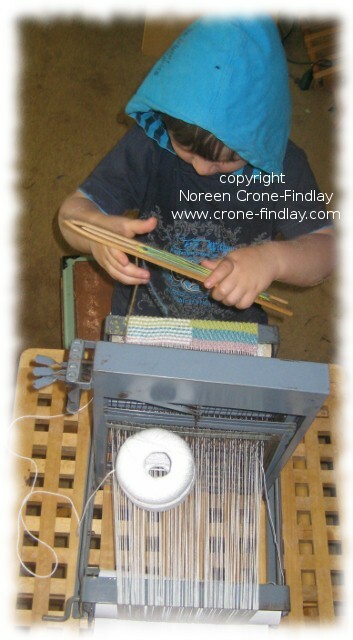 And, whenever I look at them, I will have such happy memories of weaving at the loom with our wee boy.